Professor Mbulelo Vizikhungo Mzamane was a giant, whose footprints are indelibly printed on the landscape of South African literature and education. He was born 28 July 1948 in Port Elizabeth, but grew up in what was then called the East Rand, now Ekurhuleni. He was the first post-apartheid Vice Chancellor and Rector of the University of Fort Hare. His teaching experience spanned across continents. He taught English Studies, Comparative Literature and African Studies at universities in Southern Africa, West Africa, Europe, US, and Australia. He held the following positions: Teaching Assistant: English/African Studies at the University of Botswana, Lesotho and Swaziland in Gaborone, Botswana (1971-72), Teaching Assistant: English/African Studies at the University of Botswana, Lesotho and Swaziland at Roma in Lesotho (1972-73), Teacher at Mabathoana High School in Maseru, Lesotho (1973-75), Lecturer and Dean of Student Affairs at the University of Botswana , Lesotho and Swaziland in Gaborone (1975-79), Postgraduate Tutor: MA in African Literature, University of Sheffield, United Kingdom (1980-82), Senior Lecturer/Associate Professor in Nigeria at Ahamadu Bello University in Zaria, Nigeria (1982-86), Visiting Research Fellow, Southern African Research Program, Yale University (1986-88), Visiting Professor: Comparative Literature/African Studies, University of Georgia in Athens, Greece (1988-90), and Associate Professor, African Studies Director, Coordinator of Cultural Diversity at the University of Vermont in the US (1990-95). His repertoire of writing includes Mzala (1980), Children of Soweto (1982), Children of the Diaspora (1996) and a children's book entitled Race between the Turtles and the Cheetahs (2004). He edited short story and poetry anthologies, namely Selected Poems: Mongane Wally Serote (1982), Selected Poems: Sipho Sydney Sepamla (1983), Hungry Flames and Other Black South African Stories (1986), and a tribute to two young South African writers who died in the early but brilliant start of their writing careers, Words Gone Two Soon: Tribute to Phaswane Mpe and K. Sello Duiker (2006). He co-edited Global Voices: Contemporary Literature from the Non-Western World (1995), which was described as "the most comprehensive anthology on the subject available anywhere in the world." Mbulelo Mzamane's scholarly publications include Images of the Voiceless: Essays on Popular Culture and the Media (1988, with J. Haynes and A. Bamikunle) and Multicultural Education in Colleges and Universities: A Trans-disciplinary Approach (1998, with H. Ball and S. Berkowitz). He was commissioned by the Southern African Democracy Education Trust to edit Road to Democracy in South Africa, Volume 2,1970-1980 (2006) and a companion volume of South Africans Telling their Stories. Former President Nelson Mandela and his successor, President Thabo Mbeki, appointed Mzamane to serve on the SABC Board and the Heraldry Council. He was founder chairman of the Institute for the Advancement of Journalism, which he served for eight years. He was also the founding patron of the Freedom of Expression Institute, and the founding director of the Book Development Council of Africa. He also served as chairman of the African Arts Fund (under the auspices of the United Nations Centre against Apartheid) and served on the board of the Newtown Film and Television School. Death overtook him while he was engaged in two major projects, amongst others, producing, under the auspices of the national Department of Arts and Culture, an Encyclopaedia of South African Arts and Culture (ESAACH) and a biography of Brigalia Bam. 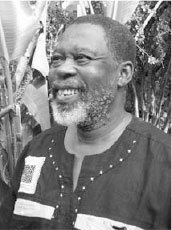 Mzamane served the literary and educational fraternity in numerous other capacities. The late President Mandela described him as "a visionary leader and one of South Africa's greatest intellectuals." Mzamane died on Sunday 16 February 2014 and was buried in Kwa-Thema, Springs, on 27 February.